MoonMarble.com - George Pavliscak - "Green Monster Eye"
Art Glass → Contemporary Handmade Marbles → George Pavliscak - "Green Monster Eye"
This is a signature style contemporary handmade marble by artist, George Pavliscak. 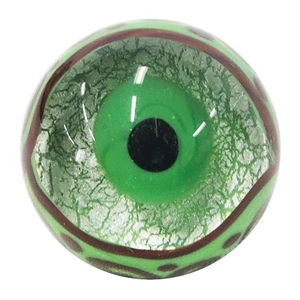 This marble resembles an eyeball with a scaly green and red design on the eye lid and back of the marble. It has silver foil behind the black pupil and green iris. Approximately 1 1/8" in diameter.